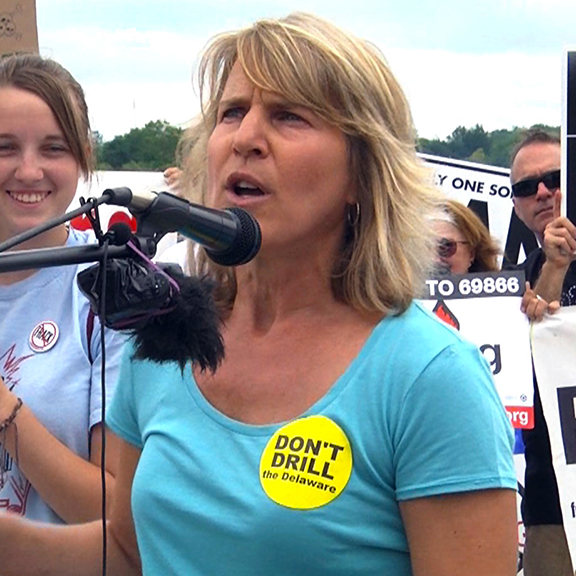 Maya K. van Rossum has served as the Delaware Riverkeeper and leader of the Delaware Riverkeeper Network since 1994. Maya is the founder of the national Green Amendment Movement. In her role as the Delaware Riverkeeper, Maya has dedicated her life to being the “voice of the Delaware River.” She has taken on industry, government, and even the U.S. Army, preventing harm to the River, communities, and environments she bravely champions. Now, Maya is working to empower individuals across the nation to stand up for their environmental rights by pioneering the Green Amendment Movement. Follow Maya’s blog to read news about her work and her analysis of current environmental events. In 2013, Maya and her organization achieved a major victory in the landmark case, Robinson Township, Delaware Riverkeeper Network, et. al. v. Commonwealth of Pennsylvania. The case, decided by the Pennsylvania Supreme Court, revived the state’s long-ignored Constitutional Environmental Rights Amendment, empowering it to protect the people’s right to pure water, clean air, and a healthy environment. The Green Amendment movement is inspiring communities across the nation to secure their own constitutional right to a healthy environment by pursuing Green Amendments in every state constitution and ultimately at the federal level. She is a licensed attorney in three states: Pennsylvania, New Jersey, and the District of Columbia. Since 2002, Maya has served as an adjunct professor and director of the Environmental Law Clinic, which she founded, at Temple Beasley School of Law. In 2013, Maya testified before the U.S. House of Representatives Energy and Commerce Committee opposing a bill that would make it easier to approve fracked gas pipeline projects cutting through creeks, rivers, communities, wetlands, forests, and farmlands. In 2000, she testified before the U.S. House of Representatives Committee on Resources regarding wild and scenic designation for the lower Delaware River. In addition to her own book, The Green Amendment, Maya has authored forewords for Damming the Delaware: The Rise and Fall of Tocks Island Dam by Richard Albert, and A Paddler’s Guide to the Delaware River by Gary Letcher. To her own surprise, Maya has inspired environmental advocates and musicians alike. In 2005, The Donuts wrote a song in her name, titled “Maya van Rossum’s Blues,” about an oil spill that spewed 165,000 gallons of heavy crude into the Delaware. Maya grew up in the Delaware River watershed, playing in Ithan Creek, a tributary to the Darby, which is a tributary to the Delaware. After law school she returned to the Delaware River watershed to take on the role of fighting to protect it, along with each and every tributary stream including her beloved Ithan Creek. New York State Bar Association Environmental and Energy Law Section Legislative Forum, Keynote Address, May 23, 2018. Tulane University Environmental Law & Policy Summit, Keynote Address, March 10, 2018. Alliance for New Jersey Environmental Education Annual Conference, Keynote Address, February 19, 2018. Midday on WNYC, Interview with Jami Floyd, February 23, 2018. Global Energy and Environmental Law Podcast, Interview with Myanna Dellinger, 2018. E&E News, January 5, 2018. Law360, “We Need a Green Amendment,” Expert Analysis and Opinion piece, December 1, 2017. 10th Annual DuPont Summit on Science, Technology & Environmental Policy, “Environmental Constitutionalism: A New Tool for Environmental Preservation,” December 1, 2017. TedX Talk, “A Healthy River: Protecting It for the Generations,” October 17, 2015. National Environmental Justice Conference, “Pure Water, Clean Air and a Healthy Environment … For the Generations,” March 13, 2015. New Jersey Governor Murphy’s Environment & Energy Transition Team, 2018. Living Now Evergreen Awards GOLD Winner in the Nature Conservation category for The Green Amendment, 2018. The Living Now Evergreen Book Medals were founded to “commemorate world-changing books”. Woman of the Delaware River Watershed, PennFuture, 2018. Foreword INDIES Book of the Year Finalist for The Green Amendment, Foreword Magazine, Inc., 2017. Modern Day Difference Maker, Women of the Revolution, 2016.